Wildflowers will attract many insects especially butterflies to your garden. Plant a wildflower prairie garden or meadow, green roof or nectar corridor to provide the insects with food and shelter and add beauty to your garden with their colourful blooms. Many xeric garden birds are attracted to seed heads of wildflowers such as thistles and cosmos, especially during the colder months when not much else is available. Grasses provide food too. 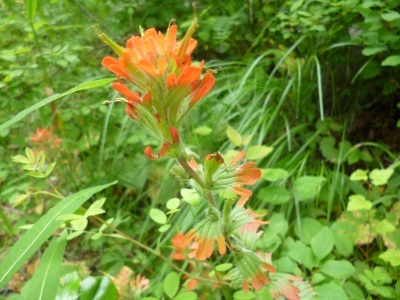 Wildflowers or native plants as they’re sometimes called vary according to the climate where they originate. 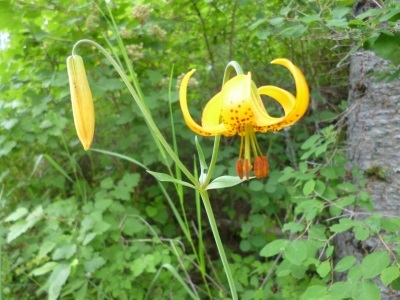 Certain wildflowers may or may not be native to your area, but depending on the conditions where they evolved, and their ‘provenance’, you will find something perfectly suited for your xeric garden. Please don't dig up or disturb wildflowers that you come upon in natural landscapes - some wildflowers, especially hardy orchids are so specially adapted to their environment that the slightest disturbance will kill them and have far reaching effects on the wildlife in the habitat. Instead, enjoy them in a photograph. 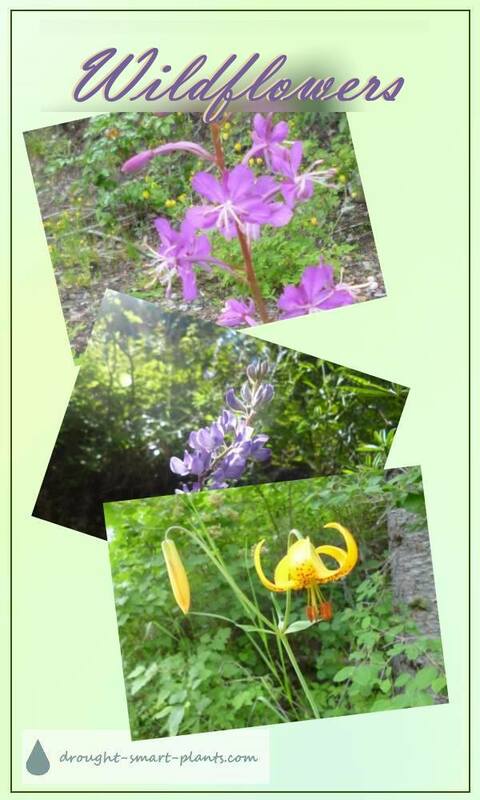 These three lovely wild orchids grow within a kilometer of my house! There is a lot of variability in cold hardiness, drought tolerance, and preferred soil type in wildflowers. Try and find seeds collected from areas colder and dryer than your own for best success in your conditions. It's recommended that you get permission before collecting seed from the wild or from private property, and only take between 5 and 10% of the total available. It's tempting to fill your pockets, but in reality, a few seeds will go a long way. The cheapest way to buy seeds of wildflowers is not always the best. Many seed companies offer low priced mixed seed which can contain undesirable species or even weed seeds. Even though it seems like a good deal, shy away from these mixes. I prefer to buy individual types so I can create my own mix of species. It’s more expensive than buying a pre-mixed selection, but will give you much more control over quality and give you the species that you want. 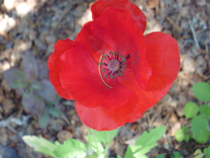 Papaver rhoeas is the famous red poppy of Flanders Fields. Imagine the shock and surprise as millions of them emerged after years of dormancy due to the disturbance by bombs and shells during the war. In Canada, we use it as a symbol of the end of World War II on November 11 every year, known as Remembrance Day. Some types of wildflowers are known as pioneer species, as they’re the first to colonize broken land and will die out once other species take over. They flourish in open soil, reseeding themselves for a couple of seasons, but the seeds become dormant once the soil is shaded by other perennials. If the soil is disturbed for any reason in the future, you’ll be surprised by the re-appearance of that species. Combine perennial wildflowers that complement each other ecologically with as much variety of form, height and spread as possible to provide biodiversity for insect life. Add some annuals for colour and quick coverage, and your wildflower meadow will start attracting insects and other wildlife in the first season. Some of the perennials you choose may take a year or even two of getting established before they bloom, so be patient. 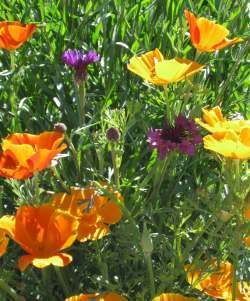 Growing wildflowers from seed is relatively easy as they don’t require a lot of care. You can seed them where you wish them to ultimately grow, mixing the seed with some sand to spread them far enough apart. The drawback to this method is that it’s very hard to completely eliminate weed seeds from the soil, and it’s extremely difficult to tell the germinating weeds from your native plants. I prefer to plant the seed into plugs, which can then be planted in their final position in your site. This enables you to grow them to a size that ensures their survival in a protected area, and once they’re big enough you can plant them in exactly the right place in their permanent home. Nature has a planting strategy when making wildflower meadows that finds the perfect conditions for each plant, which we have to try and mimic. Examine closely the way nature does it, and copy the system. Sun exposure, type of soil, and the natural moisture in your area will all have a bearing on how well your wildflowers will adapt. I like to plant in drifts of several to many of the same kind of plant, which is the natural way for wildflowers to grow. Avoid the ‘polka dot’ method of planting, which looks contrived. 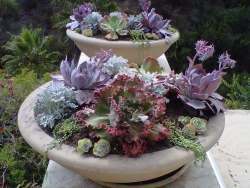 You can leave some areas bare and use mulch, or scatter seeds of annual plants to fill in. Grasses make a great foil for wildflowers, with their complimentary forms. I use plug trays that fit into a 1020 flat. You can find these with different cell sizes; I prefer those with 72 cells or 50 cells. These are shallow enough that you don’t have to dig a huge hole when you go to plant them in their final location. Make sure you label all your seeds; if you’re like me, your memory can be somewhat short. Keeping a record on a card file will help too, especially with some of the tongue twisting botanical names, if you want to remember those. Soil should be pasteurized soilless media; I like Sunshine Mix #4, which has extra drainage in it, which is less likely to get algae and moss growing on the surface. I don’t recommend the use of garden soil as it usually will have dormant weed seeds in it unless you can pasteurize it. You will also need to mix some perlite, pumice or vermiculite with it to prevent it from packing too tightly. I sprinkle the seeds sparsely on the top of the soil, and depending on the size of the seed, cover it or just press it gently into the soil. Water gently, either with a fine spray or soaking from below. Some species of wildflowers require a cold period to initiate germination, called stratification. This means that you have to seed your flats in the winter and put them outside in the cold for up to two months before they’ll germinate. You can also mix the seed with damp peat moss and then freeze it for a month or so in the refrigerator before seeding into the flats. Wildflowers have evolved to survive and thrive in poor, lean soils, so adding any fertilizer other than possibly a small amount of compost will be counterproductive as it will encourage lush leggy growth which is weak and prone to disease. Roter till the area, or dig it over a few weeks before you want to plant. The weed seeds will germinate, and you can rake or dig it over again to kill them. You can also skip this step, using cardboard or newspaper to shut out the light, which will kill the weeds. This is known as lasagna gardening. Plant your plugs directly through the newspaper and then mulch with grass clippings, chopped leaves or sawdust to hold moisture in the soil and prevent more weeds from germinating. Perennial wildflowers are those that live for many years, and many are herbaceous, meaning they die back to the ground every fall, to re-emerge from the roots in the spring. Some examples of this type of plant are Aster, Rudbeckia and Echinacea. These can be propagated by division; dig up the root of the plant and cut it into several sections with a sharp knife, spade or saw. Make sure each section has some roots and a bud for new growth to emerge from. Replant in other areas and you’ll have new plants which will most likely bloom the first season. Achillea millefolium - usually white, occasionally other pale colours this flat landing pad of tiny blooms in an umbel will attract many pollinating and beneficial insects. Linum perenne – sky blue flowers in June and July – planted in large groups they look like a lake or pond reflecting the sky. This is the same plant used to make flax and linen. Liatris – spires of bee attracting purple flowers. Penstemon – tubular blue or purple flowers beloved by bumble bees. Gaillardia – Blanket flower with striped yellow and red daisy like flowers and a large central disk. Rudbeckia hirta – black eyed Susan, with its gorgeous golden blooms will attract many insects such as native bees and wasps to your garden. Eupatorium maculatum – Joe pye weed – butterflies love the large umbels of pink blooms. Plant this where it will get more moisture such as in a rain garden or bog garden. Echinacea purpurea – purple coneflower comes in purple, pink and white. The large central cone is usually green to brown. Ratibida columnaris – red and yellow daisy like bloom with a prominent centre cone – also called Mexican Hat. Silene armeria rubra – hot pink sticky blooms beloved by insects. Eschscholzia californica – California poppy – silky blooms in many shades of orange and yellow - also available in pink shades, or mottled. Very drought tolerant and will self seed. Lupinus texanensis – Texas bluebonnet – small blue lupine, will form a sea of blue. 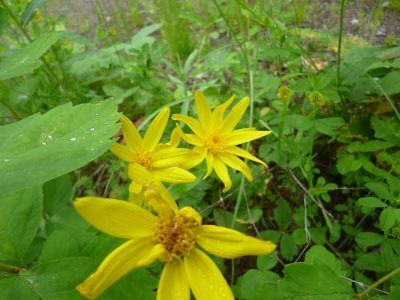 Coreopsis – daisy like yellow or red blooms, self seeds with abandon when happy. These are just a few of the fascinating plants we call wildflowers. You’ll find your own favorites while doing research, and they’ll quickly become classics in your garden.